It’s no surprise to us that Porsche’s top-selling vehicle (in Canada, though U.S. specs are similar) just received an upgrade. Though the 2019 Macan doesn’t look vastly different than this year’s current model, a handsome facelift paired with engine upgrades are a welcome level-up. Who could blame people for wanting a Macan, anyway? Sure, you’re not getting the complete Porsche experience with a Carrera or a 918, but it’s a functional compromise that many drivers are willing to make. With reasonable ride height and light off-road capability, all with a lower center of gravity than a Cayenne (and a heck of a lot cheaper, too), the Macan is arguably Porsche’s most practical, reasonably priced and overall best-valued model. Your Source for Independent Porsche Repair In Pasadena — Including Macan Service! 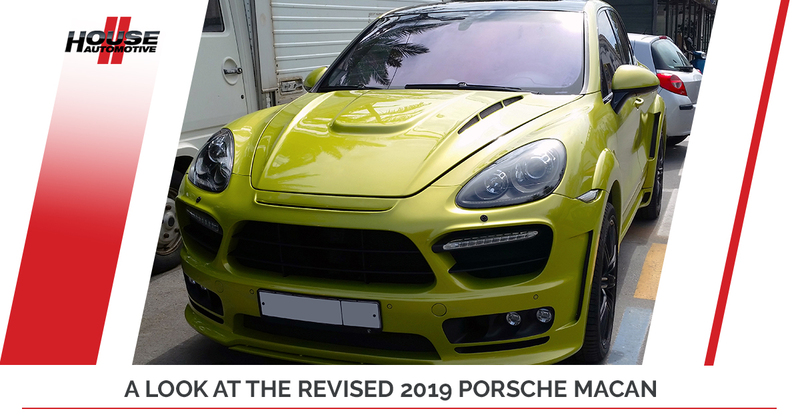 In a diversion from our usual obsession with 911s, HOUSE Automotive, your Pasadena independent Porsche repair experts, take a look at the latest iteration of the Macan. If you need service for your earlier-model Macan (we see many Macans roll through our Porsche shop) or other Porsche model, rest assured that we’ll always be there for you. Schedule an appointment by visiting here. This year’s model upgrades can be characterized as “business as usual in the front, party in the back.” That’s because all that’s really changed in the front are new LED headlights and redesigned front air intakes. The rear end, however, now features an LED taillight strip that spans across the entire width of the vehicle, akin to that of the new Panamera and Cayenne. In person, it’s nothing shy of staggering in terms of how modern and sleek the Macan’s rear looks — that is, if you allow us to be a little risqué. 7-inch screens just don’t do it anymore these days. Let’s face it; technology is an integral part of our lives and without computers doing all of the hard work in our day-to-day lives, we probably wouldn’t know what to do or how to get around anywhere. Well, like the massive screens in Tesla vehicles, Porsche decided to up the ante with an 11-inch screen in the new Macan. We see you, Porsche. Moving the air vents below the screen just to make room for this LCD behemoth, what you’re looking it has actually been standard with the Cayenne and the Panamera. In fact, the Macan has been so closely following the Cayenne and Panamera in terms of design and developments that you should just pay attention to those models to find out what’s next for the Cayenne’s little sister. Oh, and don’t worry, there’s still a manual clock tastefully displayed on the dash if you’re more of a Flintstones person versus The Jetsons. It’s not 100 percent clear what the engine lineup for the United States is (hint: Euro-spec models will get all of the goodies, not the scraps left over for the NA market), but expect a fairly significant increase in power. The base model 2.0 liter inline-four should jump from about 252 horsepower to a very reasonable 300 horsepower, enough to whip you and the family dog up and through those mountain passes. Things get even better with the V-6 models, though. The Macan S will generate about 350 horsepower thanks to the single-turbo 3.0-liter engine; however, if that’s enough horses under the hood for you, the Macan Turbo should produce around 440 horsepower thanks to a twin turbocharger. That’s…realistically, more power than we can legally condone. With an “optimized” chassis, Porsche promises a more engaging and dynamic ride than ever before, paired with an improved and refined all-wheel-drive system. As far as news on a potential hybrid goes, we’re unsure what’s to come. Porsche is making more of an effort to incorporate hybrid options into its lineup, so stay tuned on that matter. For a small base price just shy of 50k, you too can be a proud owner of a Macan. If your Porsche needs some love — whether or not it’s a Macan — the choice is obvious. Stay tuned for more Porsche news via our blog, our schedule an appointment today!